Readers of Golfweek magazine consider the Robert Trent Jones Course at Palmetto Dunes Oceanfront Resort to be one of the best golf courses in the Southeast. This Hilton Head golf course was extensively renovated in 2002. The renovation work, led by longtime Jones protégé Roger Rulewich, involved reshaping and restructuring tees, greens and bunkers. Fairways were elevated and reshaped, and the course’s natural drainage was improved by linking it with the golf resort’s unique, 11-mile lagoon system. Today, the lagoon system winds its way through 11 of the golf course’s 18 holes. When the renovation was completed, the Jones Oceanfront Course was named the 2003 Golf Course of the Year by the South Carolina Golf Course Owners Association. The signature hole of the Hilton Head golf course, the par-five 10th, offers a spectacular view of the ocean. In fact, it’s one of only two oceanfront holes on all of Hilton Head Island. 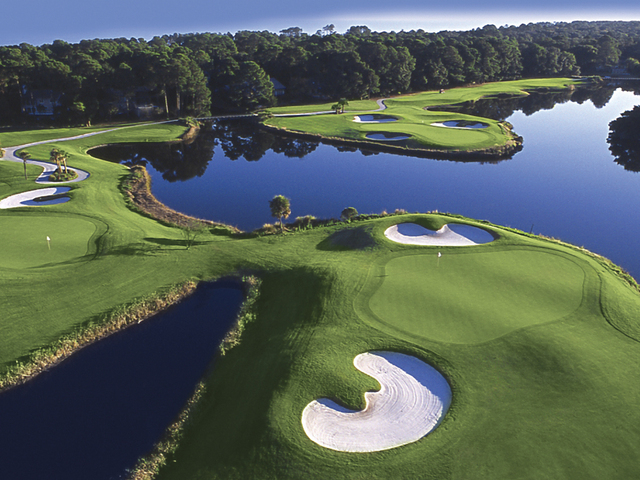 The course is so beautiful and so challenging that it was selected to host the second round of play in the 27th Annual Hilton Head Island Celebrity Golf Tournament.